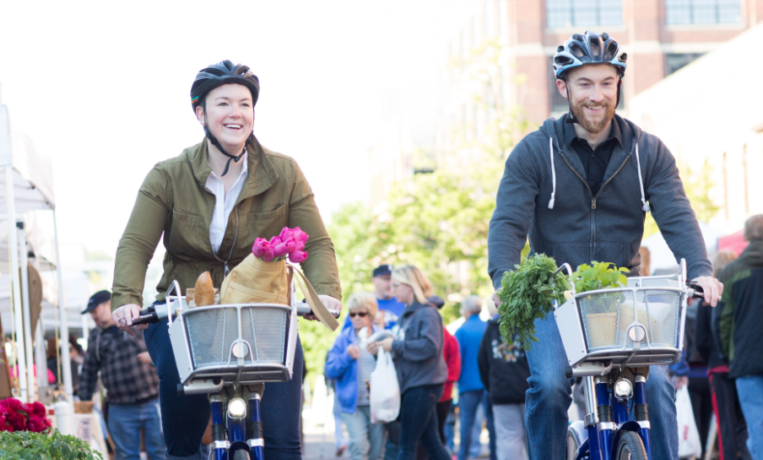 Heartland B-cycle is Omaha’s bike sharing system; a public transportation network of bikes. With 33 stations and 180 B-cycles available to the public throughout the metro area Heartland B-cycle is a bike when you need it, and gone when you don’t. Bike sharing makes it economical and convenient to use bikes for trips that are too far to walk but too short to drive. As a member, you can use a B-cycle to run an errand, grab lunch, travel to and from the bus stop, or just get some fresh air. The B-cycles are specially designed for both you and the city: B-cycles fit people of all sizes, thanks to easy to adjust seat posts. Short or tall, you’ve got stuff and that’s why there’s a basket to stow your things while riding. Fenders, skirt guards, and chain-guards keep your clothes clean. Automatic lights help to keep you safe and three speeds are perfect for changing grades. Working similar to bike share programs in other cities, to use the system you must first purchase a pass. With a valid pass you can check out a bike at any station and drop it off at any station in the system. There is no additional charge for the first hour of every ride. There are no limits to the number of times you can check out a bike, but any trip lasting longer than an hour costs extra, so instead of checking out a bike to ride home and ride back the next day, you’d check out a bike to ride to a station close to home, then check out a bike the next morning to ride back to a station on campus. Passes are $6 for 24-hours, $10 for a monthly pass, and $80 for an annual pass, with discounted senior and student passes. Stations are located throughout the metro area, including UNO, Midtown Crossing, and downtown. Popular uses include running errands, getting exercise during the work day, or connecting to existing transit networks. As part of a large federal grant, B-cycle is planning to expand away from downtown and this will include the Med Center. They are looking for the right locations on campus for station placement, and would like your input.